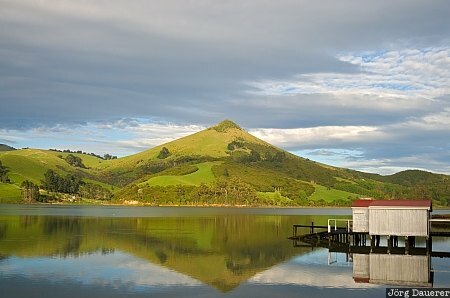 A boathouse and its reflexion in Hoopers Inlet with Harbour Cone in the background on the Otago Peninsula, Otago, on the south island of New Zealand. This photo was taken in the morning of a rainy day in November of 2008. This photo was taken with a digital camera.